Category: Possibly a fourth record? I have been able to work on writing several new songs that I believe will make up the fourth YHP record. There are still a few final decisions to make and I may try to write some new songs to see if I can beat some of the older ones, but I think I have the bulk of the songs ready for the record. Now comes the anticipation of getting everyone together to make this record. Scheduling is always tough, but it’s gotten much tougher. Some initial pings to people to check their availability have revealed that they’re ready to make another YHP record. It’s certainly been too long since I’ve gotten some decent Little Rock BBQ, catfish, etc. I think the band feels the same. Stay tuned for updates, but it might take a while for this new record to come together. Life is complicated. The new songs are largely written from a rather specific perspective of getting the band back together and writing for that band. Because of that, I don’t want to work on them anymore until I get to work with the band. I need something new to do. I have decided to finally take the plunge and learn more about recording at home. Here’s my new drum recording setup based on Glyns Johns’ method. Up until recently, I have always tried to keep my home recording setup pretty simple. I haven’t wanted to get particularly fancy or good at recording because (1) I was hesitant to invest in the right gear and (2) that was never my main focus. I have always just wanted enough to record demos of my songs to document my ideas preferring to leave the recording to the professionals. Circumstances have changed. I am not able to get to the studio so easily and it can be difficult to find the time to get everyone together. I have also started to think about trying to write different kinds of songs — songs that weren’t so tied to the band that I could record myself. That’s when I finally accepted the idea that I should spend some time thinking about how to record things better than I have been. Jason has been hugely supportive and helpful. He donated some mics and got me started on finding the right kind of gear that I would need. He’s also patiently dealing with tracks that I’ve recorded and helping with notes on how to improve my recording. I’ve recorded one new song so far, and things are progressing well. If I do more and I think they’re interesting, I may post things to soundcloud. Maybe I’ll come up with a different moniker. For these songs, I am trying to keep things much simpler. I am focusing on more standard chord changes and considering more experimental sonic elements. Lyrically, I’m trying to explore different kinds of voices and streams of thought. I don’t have broad themes identified, but it’s fun to think about songwriting by thinking about doing something different from what I have been doing. The one thing I have committed myself to is having everything be performance-based. I would like to adhere to the idea that things should be happening before the box rather inside of it. If I can’t play the thing with the sound that I want to have on the recording, that means I have to practice until I can. In that way, I am hoping to get better at everything I try to do. It’s too easy to fall back on old habits or compensate for my shortcomings through avoidance. I need a mechanism to force myself to push beyond my capabilities. Otherwise, I’m not going to be interested in what I’m doing. Written by yellowhope Leave a comment Posted in Possibly a fourth record? This is what my current work space looks like. 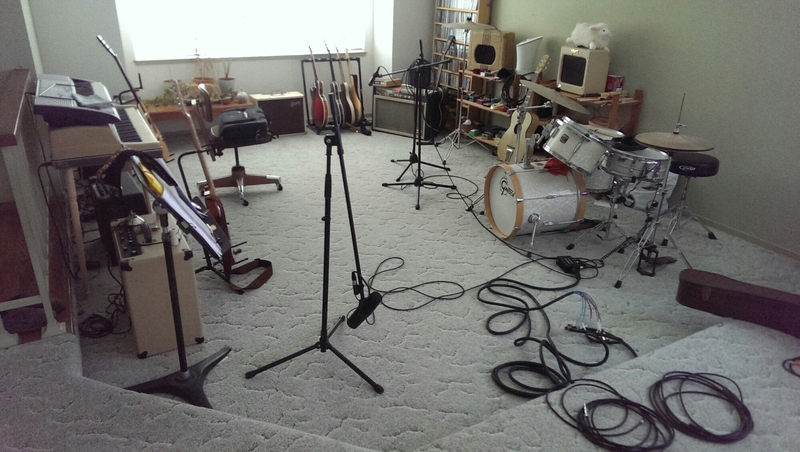 I had just finished tracking some drums, so there are cables strewn all over the floor. After a long hiatus, I’m back to writing songs. I’d love to be able to write a new batch, get the band back together, and make anew record. It’s always a challenge to get back into writing after taking a break. Breaks after finishing a record are necessary for me. I spend so much time inside the set of songs for a record that it’s good to get some distance. Over the first three records, I had been progressively shrinking the breaks between them, but this time around, I needed to take a longer break. Now that I’m no longer a swinging bachelor, I have had to figure out a way to make time for writing. Additionally, the way I write needed to change. Before, I could have easily declared any random day to be a song-writing day and spent the majority of that day just working on a song. Now, I only have finite windows of time on a given week — even this short blog post has taken me over three or four days to complete. I have had to learn how to work in stages and document my progress much more carefully. The good thing is that I have had to do this in my academic research work. I know how I need to do this. It’s just an initially uncomfortable adjustment because it interrupts the previous workflow I established. It’s difficult to stop once you get going. I don’t like looking at the clock when I’m recording. It rushes me. But then again, that’s what I got, so it’s better to make due rather than not do anything at all. Check me out! I’m now able to do some fancy things like send out my mixes to outboard gear. Here I am sending out a mix to a Strymon DECO to give it some tape compression/saturation and some modulation by double-tracking. I treated myself to some new recording gear. I recently picked up a 4 channel audio interface and some extra cables, so now I’m using a full Pro Tools setup. This new gear along with working solely in Pro Tools works out a bit better for working on songs in spurts since I can make a bunch of notes easily and visually see the progress between sessions. It also allows me to do some fancier things than I had done in the past. 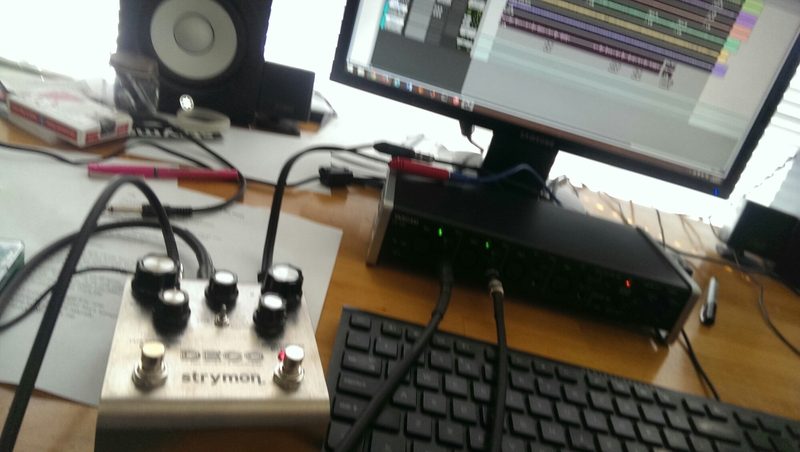 For example, I am now experimenting with sending audio out to gear like my Strymon DECO for some tape compression on my mixes. I still plan to keep things really simple, but I’m already achieving better sounding tracks with this new approach. Before, I used a stand-alone digital 8-track. Then I uploaded those tracks into Pro Tools to edit them. That setup had a certain simplicity to it. I liked the limitations that it imposed, especially with regards to getting a complete take. Having recording separated from editing made playing too removed from editing, which I like to keep very separated from one another. As a result, I just had to construct and practice the part in its entirety until I got it. That was most challenging for my drumming, but I have gotten much better at playing drums as a result. I did/do small punch-ins here and there, but that’s it. From the editing point-of-view, I think that it makes a difference. It does to me, anyway. One thing that happened to me as I started to think about writing again is that I started to second guess what I had done which, in turn, led me to second guess what I should do next. I suppose it’s natural to have doubts when you make records. It doesn’t help that our world is one that really doesn’t listen to records anymore. Still, I started to think about if what I had done was done “wrong,” and perhaps if I did something differently, it might be “right” this time. It all comes down to seeking external measures of self-validation, I suppose. If that’s the case, there’s no squelching this. I know at least that much. That’s not how this sort of thing works. A few weeks ago, I listened recently to an interview with Dan Wilson where he talked about this very idea. He had put out a Semisonic record that he really liked, but didn’t hit. He said his A&R guy or manager told him that if an artist puts out a record that they really love, but doesn’t do well, they should do it again. I’m paraphrasing, but that is how I have interpreted what he said. Anyway, he followed that advice and wrote “Closing Time” which ended up being a rather big hit. This idea was pretty huge for me. The truth is, I really like how I’ve been making records. I would love to make another record the same way I’ve been doing it. Sometimes it feels like I shouldn’t feel that way because of any number of reasons: record sales, friends’ responses (or lack thereof), etc. I cannot verify those things, but the thing that I can certainly verify as being true is that I really like how I’ve been making records. So given that certainty and the uncertainty of everything else, why would I second guess or talk myself out of forging ahead? I suppose it seems so simple now, but that simplicity points to why it must be correct. It’s established. I will forge ahead feeling good about what I have done and what I will do. So what exactly does that mean in terms of another record? I think the songs that there are two types of songs of mine that have seemed to work best. Examples of the first type are Could You Find It In Your Heart to Love Me? and I Actually Feel Pretty Good Today. I’m not sure how to categorize those songs. For me, they’re inspired by older pop songs that sound almost cheesy, but have really sophisticated underpinnings. To me, I came about to these types of songs from listening to Big Al and Joey Spampinato songs. They mix sophisticated chord changes, but aren’t overtly “jazzy.” To some, these songs might sound a bit schmaltzy or adult contemporary-ish, but I have grown to love these types of songs. It’s because of the chords. I now spend time looking up different chord voicings, inversions, and alternatives which brings me into new territories of melody. It’s more than just hooks. Hooks are more abrupt and coarse devices. Now that guitar-based pop music is so pervasive, our ears have grown very accustomed to standard chord voicings. By changing things ever-so-slightly, I think you can achieve a more subtle color that is felt over the entirety of the song rather than just some clever hook. Another thing that has really affected me is an interview that Blake Mills did for Fretboard Journal. When he talks about the song “Don’t Tell All Your Friends About Me,” (at around 24:00) he talks about the voicing of the very first chord. I think it’s a B-flat. He ends up tuning the guitar to feature that voicing. It’s so intelligent. The progression is familiar — it’s just a walk down from the 1 to the 4, but the voicings lead you to hear it so differently. If you have the time, also watch him discuss and play “Cry To Laugh” (at around 55:00). It’s ridiculous. I know what he’s talking about when he’s talking about Randy Newman’s piano playing incorporating really small changes with large sounds. There’s a style of guitar that adheres to that notion, but I forget what it’s called. I wanted to learn it so badly when I was young, and I never did. It’s kind of related to playing “horizontally” rather than “vertically” (in relation to the staff). For the second type, I really want to explore more songs like Troubled Girl. It’s a pop song with a pretty standard chord progression, but the rhythm and groove are really interesting and compelling to me. That song actually started as my homage to the Shirelles’ “Mama Said,” but it morphed over time to what it is now. It’s obvious to me that song comes from listening to a lot of Ry Cooder records, but maybe you didn’t know that. A big song in my life is “Fool Who Knows” from the Little Village record. First, it’s Nick Lowe at some of his finest. But the combination of Keltner’s drum part and Cooder’s slide is something that I will be chasing forever. Another noteworthy bit is the first instrumental part of Blake Mills’ “Seven.” There’s a groove to these types of songs that is different and interesting. Plus, I’d like to focus more attention on my fingerpicking and slide playing, so these types of songs are the right kind of vehicle for that. So that’s that. I’m going to continue on with what I’ve been doing. I’m going to do it for the simple reason that I like doing it. That will just have to be enough.